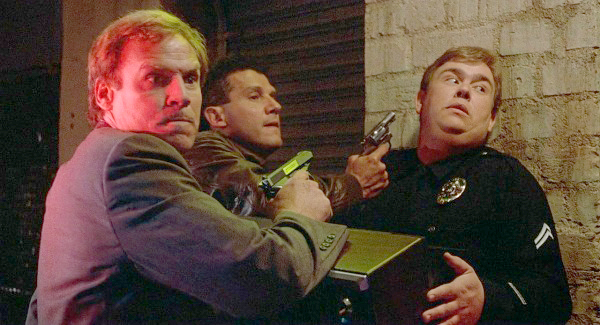 A big-city policeman (John Candy) is framed for theft and dismissed the force. He turns to private security for a job and, partnered with an unsuccessful lawyer (Eugene Levy), finds himself fighting a plot to steal union funds. Armed and Dangerous is a film the ending of which I had seen a couple of times. Since I like the lead actors, I thought I would give the rest of the film a glance. As it turns out, the ending was the only worthwhile element, and a glance was probably more than the rest deserved. John Candy was a very talented comic actor, whose skills came to the fore in the Canadian SCTV television series, someone whose off-screen likeability frequently translated to his characters. 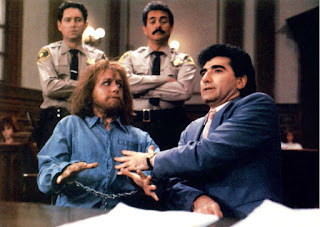 As with many men and women famous from sketch comedy, however, he often suffered from a translation to movies, and it was a rare film that gave him good writing, direction and production values. 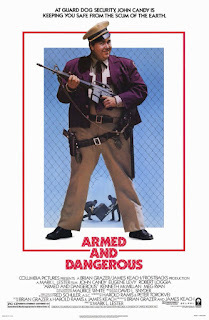 In Armed and Dangerous, he is teamed with fellow SCTV member, Levy, who has found success in the cinema and on television to a greater degree latterly than previously. As well, he has won awards for comedic writing, having co-written many fake documentaries (eg. Waiting for Guffman) and has even won a Grammy award (for A Mighty Wind). In this film, the stars are much better than the material, which gives them little reason to shine. 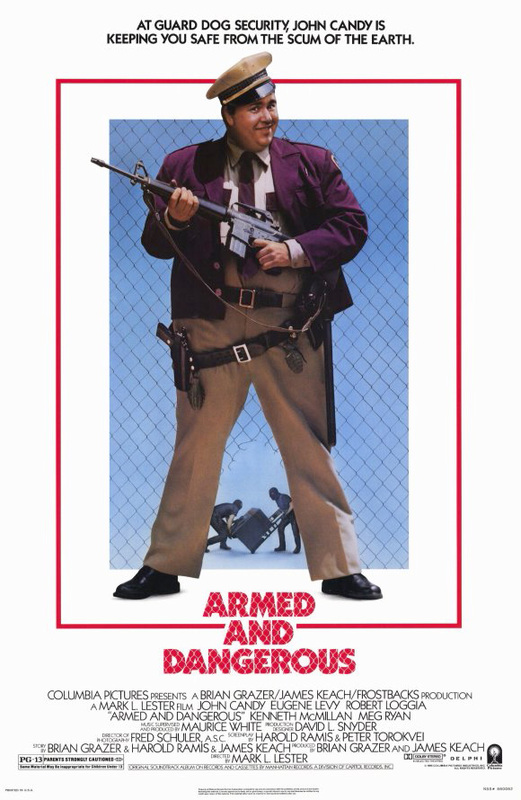 Another SCTV alumnus, Harold Ramis, co-wrote the screenplay for Armed and Dangerous, so the talent was present, though not, apparently, active. The script saddles Candy and Levy with lame situations and unimaginative dialogue. The plot is simple, though the climax is exciting; but the film is one of those in which just delivering a sound thrashing of some sort to the villains solves all the problems, criminal, legal and personal. Meanwhile, the director’s list of credits appears to boast of nothing better known than this film and Commando, a box-office draw but not one of Schwarzenegger’s higher-rated films. The production values in Armed and Dangerous don’t look as if much was spent on them, all of the money going into crushed automobiles and a couple of explosions at the end. The movie could have been much better; both Candy and Levy made good, watchable leads. Certainly, I enjoy the genre into which it falls, that of comedy-adventure. 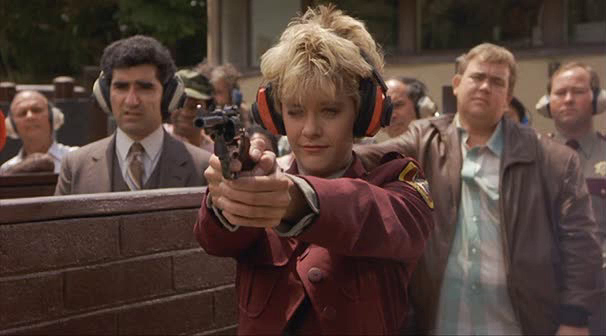 But the funniest moment was unintended: at one point, I thought of Martin Short (yet another SCTV veteran), who stated that a ‘buddy-picture’ can usually be determined by the inevitable inclusion of a scene in which the main characters are driving in a car, look at something approaching them at high-speed and scream in unison. When a comment of gentle ridicule makes a viewer laugh more than the target of the comment, that target is not doing well. Armed and Dangerous did not do well. I actually haven't seen many of his films; the one that sticks in my mind the most is "The Great Outdoors"
The best movie in which Candy had a major part was "Planes, Trains and Automobiles", though he did well in "Uncle Buck", too. It's rather embarrassing when you see entertainers whom you know are good being rather awful.